A Dragon Gate star will be challenging for the X-Division title at Impact's WrestleMania week show. 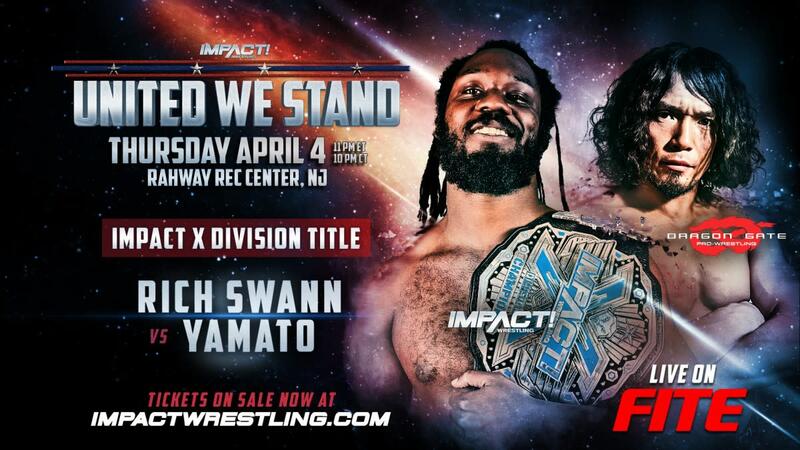 Impact announced last night that Rich Swann will defend his X-Division Championship against Dragon Gate's Yamato at United We Stand. The show is taking place at the Rahway Recreation Center in Rahway, New Jersey at 11 p.m. Eastern time on Thursday, April 4. It will air live as an iPPV on Fite TV. There will be an Ultimate X match at United We Stand with a future X-Division title shot on the line. Jake Crist (representing Impact), Kotto Brazil (MLW), Jack Evans (AAA), AR Fox (as his Lucha Underground character Dante Fox), and Pat Buck (WrestlePro) have been announced for Ultimate X. The final Ultimate X participant will be a "mystery opponent." Pentagon Jr. & Fenix vs. RVD & Sabu, Team Impact (Johnny Impact, Brian Cage, Moose & Eddie Edwards) vs. Team Lucha Underground (Aerostar, Drago, Daga & King Cuerno), Tessa Blanchard vs. Eli Drake, and Sami Callihan vs. Jimmy Havoc in a Monster's Ball match have also been announced for United We Stand, and Impact has set up a tag match between LAX (Santana & Ortiz) and Low Ki & Ricky Martinez.